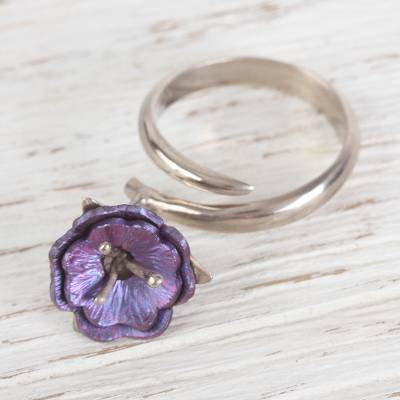 Sterling Silver Wrap Ring with Purple Titanium Flower Charm, "Stunning Violet"
Beauty blooms with this sterling silver wrap ring featuring a purple flower charm made of titanium. Handcrafted by Mexican artisan Diana Solis, the flower charm features two layers of textured petals backed by sterling silver leaves. You can find titanium and sterling silver wrap ring 'Stunning Violet' by Diana Solis in jewelry categories such as Floral Rings, No Stone Rings, Silver Rings, Sterling Silver Rings, Titanium Rings, Wrap Rings and Charm Rings. Enjoy exploring these sections for other Novica treasures.